The Big 12 tournament is underway and KU hoops star Udoka Azubuike suffered a knee medial collateral ligament (MCL) injury in practice recently. Of course, like any in-season sports injury, the timing is not good. Looks like he’ll miss the Big 12 tournament. So what’s the deal with these injuries, and everyone wants to know, will he be ready for the NCAA Tournament? The MCL is a ligament along the medial aspect of the knee. It’s more of a thickening of the joint capsule, more “sheet-like.” It is also an extra-articular ligament, or outside the joint. On the contrary, the infamous anterior cruciate ligament (ACL) is intra-articular, or inside the knee and is more “rope-like.” There are four knee ligaments that contribute to knee stability, and the MCL helps prevent the knee from “buckling” to the inside. Here is a comprehensive link on MCL anatomy and function. Illustration of the medial collateral ligament of the knee. Most of the time, the MCL is injured from a blow to the outside or lateral aspect of the knee which causes the knee to buckle inward. However, the MCL can also be torn from an awkward cut or land from a jump. It can be injured in the mid-substance over the joint line, or off of its bony attachments on the tibia or the femur. In this case, there are a number of reasons why Udoka Azubuike could have sprained his MCL – could be contact or non-contact. How long do they usually take to heal? A general rule in sports medicine with MCL injuries is that it is about two weeks of time loss for each grade of tear. Therefore, with a Grade I tear, expect two weeks out, Grade II four weeks, Grade III tear would be approximately 6 weeks out. Certainly, this rule is not an absolute as athletes may require more or less time. Proximal, or femoral attachment MCL sprains, tend to heal a little faster but can stiffen up. On the contrary, distal or tibial attachment tears tend to heal slower, but typically aren’t as stiff. All that said, injury history, concomitant injuries, time of season, level of play, and athlete confidence are just a few of several other considerations that affect return to play. Sounds like the injury to Udoka Azubuike wasn’t too bad, so we’re guessing on the lower end of this general rule. Why is an MCL sprain a big deal? 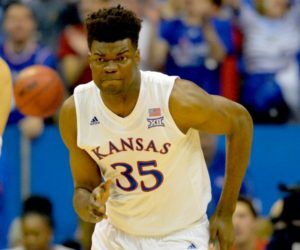 As an elite basketball player, Udoka Azubuike is frequently jumping, landing, cutting and changing direction, let alone getting hit from opponents on the outside of the knee. Given that the MCL provides medial stability to the knee and helps prevent “buckling” of the knee, it’s critical for him that this ligament is doing its job. Therefore, he needs stability of the knee during these manuevers. Without it, he could be at risk for a more serious injury, like an ACL tear. Typically, you want to avoid surgically repairing an MCL unless it’s part of a more severe injury, like a multiple ligament knee injury. Even then, surgeons usually elect not to fix it and let it heal over time. After surgery to repair the MCL, the knee stiffens instantaneously and makes rehab a significant challenge. Best to rehab these injuries at all costs. Can’t we just brace his knee and play? Well, it’s not that simple. No brace can “prevent” any further injury and if there’s any instability or pain, he’ll still deal with that, even if to a lesser extent than no brace. Certainly, they can help athletes feel more confident that “something” is there to support the knee, but it’s not much more than a “security blanket.” Remember too that athletes have to be mentally okay with wearing a brace too. Some athletes just can’t play their sport with restrictions. They’re not used to it and it’s “different.” Because he’s a basketball player and the how the timing of this injury isn’t good, we’re guessing he’ll wear a brace for a little extra protection and support. It shouldn’t affect his play at all should he choose to wear one. Control pain. Icing, compressive wrapping, a knee brace, and use of a crutch or crutches will all help reduce pain and promote healing of the ligament. 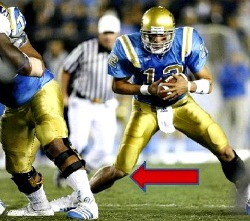 Another “training room trick” is to put a medial heel wedge in the shoe of the affected knee. Effectively, the medial wedge may decrease strain on the healing ligament by compressing the medial joint line, even if only a little. It’s one of those interventions that is by no means a game-changer, but can help. Low-intensity pulsed ultrasound (LIPUS). There was a time when ultrasound was used for everything. Therefore, its effectiveness has continually been debated and questioned. Unfortunately, it has been discarded as a useful modality and this is actually one injury where it may help. However, there are some good studies supporting the use of LIPUS for MCL healing here, here, and here. Laser therapy is also an option and can be effective for these capsular ligaments near the surface. Restore range of motion. The use of a bike, pool, or heel slides are all ways that can help an athlete restore their range. The optimum stimulus for regeneration of ligaments is modified tension in the line of stress, and tons of repetitions at that. That is precisely why cycling is a great modality for these injuries. With more severe sprains, a graded range of motion progression may be done to help prevent over-straining of weakened, painful tissue. Therefore, an athlete may have 30-90° for a couple of days, then open 10° in each direction every day or two after until full range is restored. In more chronic cases with pain in specific ranges of motion, instrument assisted soft tissue mobilization can help break up scar tissue and facilitate healing. There is one study using these instruments for this injury from the Journal of Orthopedic and Sports Physical Therapy that supports use of these tools to facilitate healing. Just because of pain, it is not recommended to use the instruments acutely. They’re best suited for chronic injuries/chronic phases of healing. Tools for instrument assisted soft tissue mobilization. Strengthening of the lower extremity. All sagittal movements (moving forward) should be painless prior to initiation of lateral and rotational movements. Lunges, step ups, squats, and leg press are just a few exercises that can be utilized. Of course, strengthening the hips should be a part of a comprehensive program for this injury. One word of caution – hamstring curls can be painful with this injury. Proceed carefully. Once straight-ahead movements are tolerated, progressing to lateral and rotational movements should follow. In Udoka’s case, they won’t be too worried about how much weight he’s pushing – they’ll just be concerned about his ability to perform on the court. Graded progression of return to sports activities. Forward jogging can commence once range of motion is restored and the athlete has passed strength testing. Speed will be gradually increased. 45° cuts, shuffling, and 90° cuts would follow, then the athlete would progress to more field or court-based sport-specific drills. A good progression is non-contact individual drills non-contact team drills, contact drills, then full release to activities. Udoka may have some discomfort as they expedite the healing process, but as long as he can perform on the court, this phase of rehab will be a quick one!! Once sports activities are painless and the athlete’s confidence is restored, return to play should be considered. Regarding bracing with these injuries, it’s really a personal preference of the athlete. Offensive/defensive linemen might consider wearing it due to bodies crashing into each other and lots of lateral, contact movements. Unfortunately, these braces sometimes make athletes a target for insidious actions by opponents. We’ll see – Udoka might wear a brace for some extra support, especially if he’s still having some discomfort or confidence issues with his knee. The biggest things to consider are 1) can he protect? and 2) can he perform? If you suffer an MCL sprain or any other knee injury for that matter, look no further than the expert physical therapists at SSOR to help you. Remember, you don’t need a physician referral to see a physical therapist in Kansas. It would be a privilege to serve you and partner with you in your care. We have locations in Overland Park & Prairie Village to serve you.